In the late 19th century, archaeologists made a stunning discovery at a site in Egypt. Instead of finding ancient tombs, they stumbled upon a Roman graveyard dating from the 1st century BC. Rather than uncovering the gilded death masks of ancient Egyptian pharaohs, the British archaeologists were confronted with the faces of Egypt’s multicultural past, literally staring up at them. 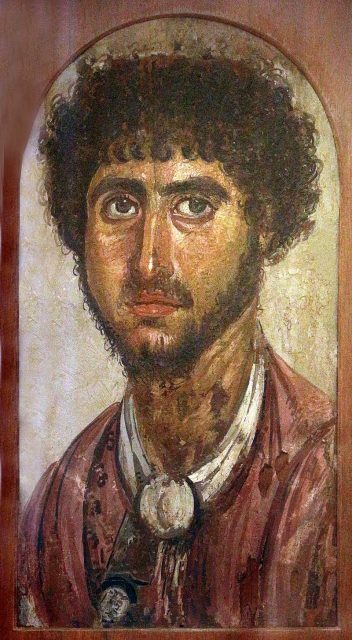 The portraits found at the Al Fayyum Oasis, and at other sites in Egypt, have been a subject of intense fascination for historians and archaeologists since their discovery. Faiyum mummy portrait of a young man. 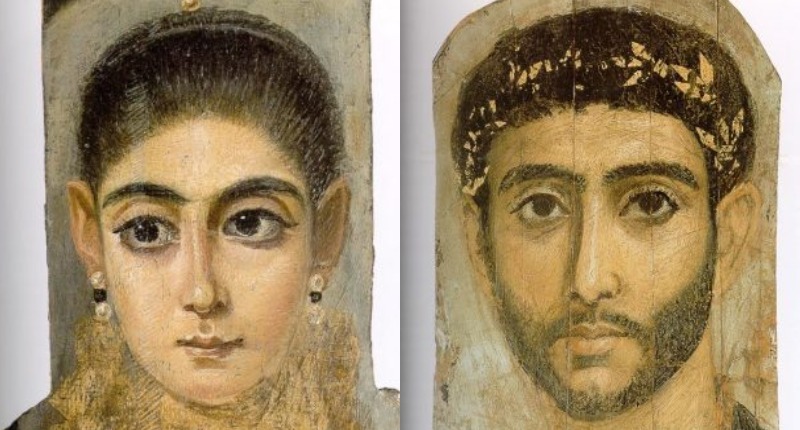 The dig revealed that Roman-era Egyptians were mummified and buried in an unusual way, with incredibly naturalistic portraits of the deceased painted on wooden panels and placed carefully on top of each body. According to archaeologist Eva Subias Pascual, the discovery of these tombs, 2000 years later, may even allow us to see the faces of Egyptians who lived at the Al-Fayyum Oasis under Roman rule. 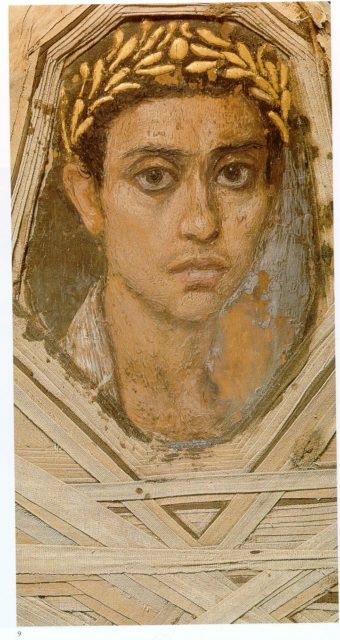 The single specimen of Gayet’s mummy portraits from Antinoopolis for which information on its archaeological context is available. The heavily gilt portrait was found in winter 1905/06 and sold to Berlin in 1907. Berlin, Egyptian Museum. What makes these portraits so distinctive is their intense realism and attention to detail. The naturalistic painting style is rarely found in other funerary art in the ancient Mediterranean and Near East, and the paintings offer rich details about the clothing, hairstyles, and jewelry worn by individuals in this period. The portraits are of incredible artistic value and show considerable skill and mastery of advanced painting techniques. According to National Geographic, they were painted on smooth wooden boards that had sometimes been primed with a layer of plaster, and used a variety of technical approaches to achieve the desired effect. The artists were highly skilled at modeling color and light, and the images are incredibly anatomically realistic. CAT scans of the mummies upon which they were found reveal that the images match the identity of the mummified body in both age and gender, which suggests that these were genuine portraits of the deceased individuals, perhaps completed before their deaths. However, as Eva Subias Pascual notes, there is considerable debate among historians on whether the portraits were formulaic or individualized. Analysis of the paintings has revealed that they conform to a standard model, in which the oval face, and position of eyes, nose and mouth remain consistent across different images. Nevertheless, they do appear to be customized with individualized traits, including variations in skin tone, hair and eye color, dress, jewelry and hairstyle. Some even contain symbols and images that indicate social status, occupation or religious affiliations. As a result, they do seem to be a genuine attempt to represent the individuals laid to rest in the tombs, even if they were completed in a formulaic process, after death. What kind of society could have produced these incredible portraits? According to National Geographic the paintings were produced in Egypt under Roman rule in the 1st century, at a time when the region could best be described as a cultural melting pot. After the conquest of Alexander the Great in 332 BC, Egypt had been transformed both economically and culturally. 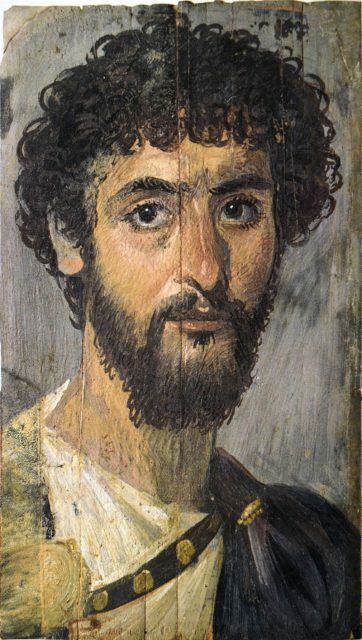 Fayum portrait of a man, mid-2nd century, Myers Collection, Eton College, Windsor. Under the Ptolemaic kings that followed Alexander, the region was fully irrigated, making it one the most productive and prosperous areas of Egypt. Al Fayyum, and the surrounding area, was soon populated by a diverse mix of Egyptians, Greeks and Romans. This diversity produced a vibrant and rich culture in which multilingualism, religious syncretism and technological innovations were all important features. 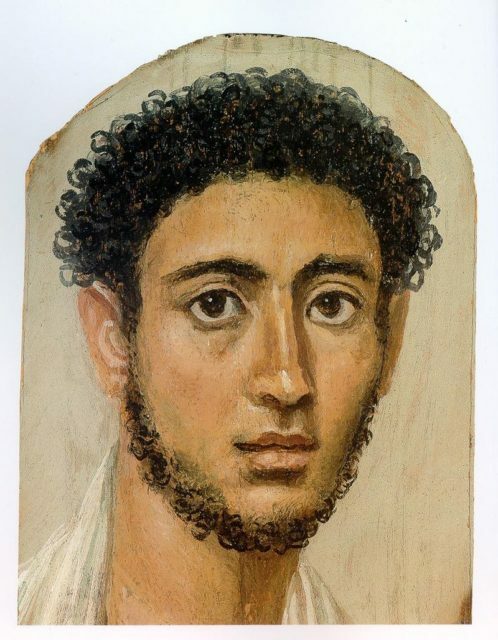 Many Greek and Roman migrants began to adopt ancient Egyptian customs and traditions, and it is in this context that the Al Fayum portraits were developed. Man with sword belt, British Museum. Mummification was an ancient tradition in Egypt, but Roman and Greek influences began to shape the ways in which it was practiced. Instead of stylized death masks, an increasing number of tombs had realistic, naturalistic portraits of the deceased in life. This vivid image was designed to be a celebration of the dead, of their life and their achievements. Soon, this tradition of funerary portraiture was a feature across Egyptian society, common in both low and high-status families, giving us the rich diversity of images found in the cemetery at Al Fayyum. 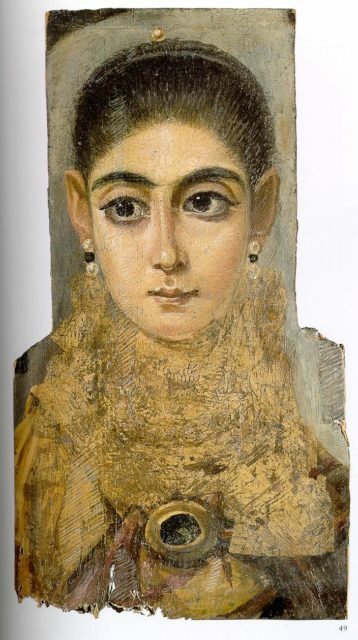 Although mummifications was banned by the Roman Emperor Theodosius I in the fourth century AD, the Al-Fayyum paintings continued to shape Roman and Greek funerary images, and their influence can be seen in art from across the Roman world dating from this period. These remarkable paintings provide a window on to the past like no other, allowing us to better understand the vibrant, and culturally profuse context of 1st-century Egypt. Moreover, the paintings show us faces from history, creating a visceral human connection between the present day and this ancient, remote society.